? For Log Style Chris Craft V8 302 305 307 327 350 cu in.
? 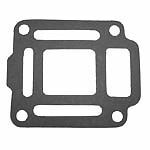 End gasket for all models except 283 cu. in. with flywheel forward.